These articles were written during the first eighteen months of the Second World War (1939-45). Raids by enemy aircraft on Britain were anticipated and later became intense. Air raid shelters provided some measure of protection from physical harm, but what refuge was there for the weary heart and mind? 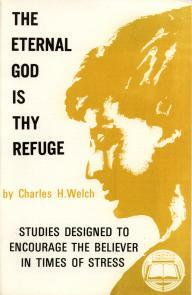 It was under those conditions of stress that Charles Welch thought it might be helpful to encourage the believers, by pointing away to the only true Refuge that they had – the Eternal God. Indeed, these articles still provide comfort and assurance for us today, and for the future. 1. The particular bearing of the word ‘eternal’. 2. ‘God is our Refuge and Strength’ (Psa. 46:1). 3. ‘A very present help in trouble’ (Psa. 46:1). 4. ‘The God of Jacob is our refuge’ (Psa. 46:7,11). 5. ‘Only’ and ‘at all times’ (Psa. 62). 6. Experimental entry into eternal truth (Ps 90 & 91). 7. ‘When other helpers fail … Lord, abide with me’. 8. The ‘secret place’ and the ‘shadow’. 9. ‘The name of the God of Jacob defend thee’ (Psa. 20:1) . 10. ‘We will make mention of the name of the LORD our God’ (Psa. 20:7). 11. ‘Fear not, I am thy Shield’ (Gen. 15:1). 12. ‘The hidden ones’ (Psa. 83:3).